With Arsenal’s forthcoming FA Cup fifth round tie against Sutton United, we thought we’d take a look at how the Gunners have fared against non-league opposition in the past. When we say “non-league” we actually mean non-Football League as, technically, Sutton do play in a league. We’ve also decided to review games since the end of World War 1 as before the war the Football League only consisted of two divisions, each with 18 teams. If we were to write a blog about all of Arsenal’s non-league FA Cup opponents, we’d be in the realms of a fair sized book! Arsenal had originally been drawn away in this first round tie to Rochdale of the Central League. However, the Lancashire club were persuaded to switch the game to Highbury which would provide them with a bigger payday. This was not unusual, Arsenal had done this in previous years, and this year Derby offered Blackpool £600 to switch venue but the Seasiders declined. It should also be noted that prior to 1925, the first round was the equivalent of today’s third round. Extremely bad weather, which resulted in a relatively poor crowd of 26,596, made for a somewhat scrappy game. Jock Rutherford opened the scoring after eight minutes, converting a Lewis cross, but two goals in quick succession by Harry Mallalieu ten minutes before half-time meant that Rochdale went in 2-1 up at the break. Alec Graham equalised from a free-kick in the 60th minute. As the game wore on, the rain turned to Biblical proportions forcing the crowd to disperse as they had resigned themselves to a draw. They missed Fred Pagnam put the Gunners ahead with nine minutes left and Freddie Groves seal the win to save the blushes two minutes later. Arsenal continued their poor form in the competition when they lost to Bristol City in the next round which meant they had failed to progress past this stage of the competition since the semi-final appearance in 1907. The Midland League’s reigning champions were hoping that their training regime of boiled eggs and an afternoon nap would be the perfect system to cause an upset. And it almost worked. After 30 mins Mansfield were awarded a penalty but Dan Lewis scooped Chris Staniforth’s shot away. 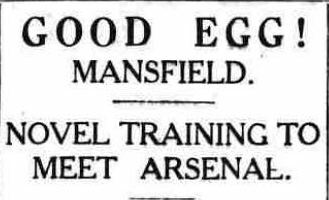 Charlie Jones and Jimmy Brain created chances for Arsenal whilst Mansfield’s wingers were also productive. However, their striking partners were not on form and both goals remained unbreached. With the minutes ticking away, Joe Hulme put in a corner which Harry Peel slotted home with nine minutes remaining. Three minutes later, David Jack went on one of his trademark mazy dribbles, scoring a fine solo goal. There was still time for Jimmy Brain to put the ball in the back of the net but the referee appeared to miss this and waved play on. The attendance was 44,925. Arsenal would eventually reach the 6th round where they lost to Aston Villa. After two relatively close shaves, Arsenal’s next non-league opponents felt the full force of Herbert Chapman’s all-conquering team of the 1930s. Darwen were reigning champions of the Lancashire Combination and would retain their title this season, and made a good start to the game with a shot on target in the opening minutes of the game. Arsenal then took control of the game; Joe Hulme opened the scoring after four minutes as Alex James and Cliff Bastin weaved their magic. David Jack added a second and Jack Lambert made it 3-0 after 15 minutes. The goals kept coming. By half-time Jack and Lambert had each grabbed another goal whilst Bastin helped himself to a hat-trick, as Arsenal went into the break eight goals ahead. 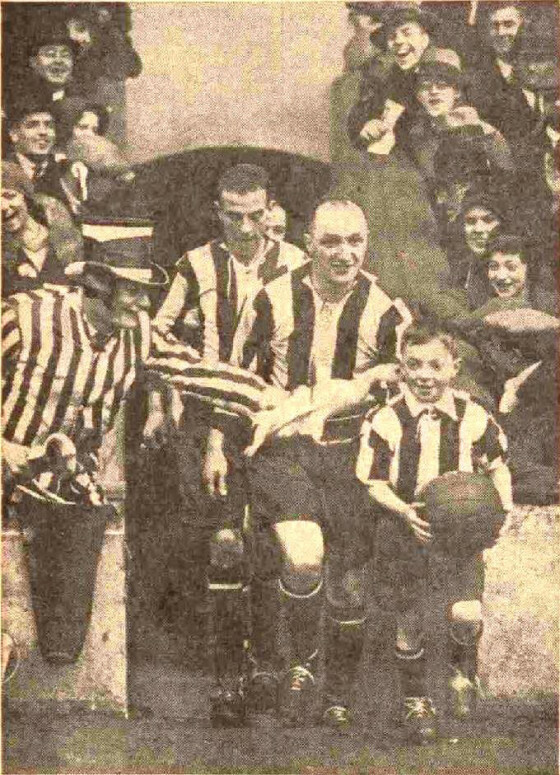 Jack completed his hat-trick five minutes into the second half and Bastin scored again to take the score into double figures. Arsenal were reduced to ten men when Charlie Jones limped off, came back on for a few minutes but had to leave the pitch again, this time permanently. The numerical advantage helped Darwen and they grabbed a consolation goal by Bob Dale after 78 minutes with a thunderbolt of a shot. Hulme finished the scoring at 11-1 which was Arsenal’s biggest ever win at Highbury, witnessed by a relatively small crowd of 37,486. The Darwen players and management team made the most of their trip to the smoke, going to watch Gracie Fields at the Winter Garden Theatre in Drury Lane later that evening. Arsenal reached the final but lost in controversial circumstances in the final to Newcastle United. This completed a “runners-up” double as they finished second to Everton in Division One. Southern League Bedford Town came to Highbury expecting to, at the most, just enjoy the experience of playing in front of a huge crowd under floodlights. It was also a return home for Dougie Farquhar who had been on Arsenal’s books between 1944 and 1950. Derek Tapscott took the honours of the first goal after twelve minutes, following up Jimmy Bloomfield’s shot that hit both posts. Vic Groves made it 2-0 five minutes after half-time, and Arsenal had countless chances to increase their lead. With fifteen minutes remaining Harry Yates split the Arsenal defence with a pass that Ronnie Steel converted to give the visitors a consolation goal. Except it wasn’t a consolation. In the 84th minute Arthur Adey put over a cross that Arsenal goalkeeper, Con Sullivan, completely misjudged allowing Bernard Moore to blast home from close range. The visitors almost caused a major upset with a good chance to score in the last minute, but they were happy enough with a draw. To view the programme in full screen, click on the icon with four arrows. Click it again to return to this page. Despite the game kicking off at 2pm on a Thursday afternoon, The Eyrie was packed tight with 11,500 Bedford fans and 3,500 Arsenal fans. The first half passed without incident, but the second half was anything but quiet. Yates put Bedford ahead shortly after the restart and then they had two goals disallowed. With five minutes to go it looked like there was going to be a massive upset until Groves headed home a high cross from the left wing by Jimmy Bloomfield. Arsenal had got out of jail. Two minutes into extra-time, another header put Arsenal back in control, this time Groves was the provider and Derek Tapscott was the scorer. Arsenal would go on to reach the sixth round before succumbing to Birmingham City at Highbury. This game was due to be played on Saturday 2 January but a four inch blanket of snow on the surface of the Huish meant that the game was postponed for four days. Yeovil were flying high in the Southern League and would go on to win the league this season. However, Arsenal were also riding high, second in the First Division and unbeaten in eight games. Despite the muddy sloping pitch, Arsenal made short work of their non-league opponents although it took 36 minutes to breach the Yeovil goal when John Radford headed home a Jon Sammels cross. Ray Kennedy took advantage of a mix up in the defence that saw goalkeeper Tony Clark collide with centre half Paul Smith as they both tried to clear a George Armstrong shot to put the Gunners two up before half time. In the second half, Arsenal shut up shop and ran the home team ragged before Radford scored his second in the last minute. The Yeovil chairman wasn’t too worried about the result as a capacity crowd of 14,374 swelled the club’s coffers to the tune of £12,000. Here’s a rather grainy video of the game. We’re sure we don’t need to tell you that Arsenal went on to win FA Cup and Football League double this season! The tie of 1971 was repeated twenty two years later. This time there was no postponement and the game was played on the scheduled date. Arsenal were somewhat wary coming into this fixture having gone out at the same stage of the competition the previous year to minnows Wrexham. On top of this the Gunners had only managed to score one goal in their previous five games whilst top scorer Ian Wright was suffering a crisis in confidence. On a positive note, in the intervening years Yeovil had moved to a new ground – retaining the name Huish but adding “Park” – which was in a much better state than that on which the 1971 game was played. After a couple of early scares, Arsenal took the game by the scruff of its neck. On 25 minutes, an Anders Limpar corner was flicked on at the near post by Steve Bould and Ian Wright struck from close range to claim first honours. On the stroke of half-time, Wright doubled the lead with a trademark lob from 20 yards having dispossessed Andy Wallace. Man of the match Wright then sealed the game and his hat-trick half way through the second half. Wallace was once again caught out by a long ball and Wright nipped in to slot the ball past David Coles. With ten minutes left on the clock, Mickey Spencer broke into the Arsenal penalty, evaded a Nigel Winterburn challenge but was upended by Steve Bould. Paul Batty slammed the ball into the top corner to give the Conference team a consolation goal. Arsenal went on to win the FA Cup, beating Sheffield Wednesday in the last minute of extra-time of the replayed final. This made the Gunners the first team to win the English cup double having beaten the same team in the League Cup final in April. Farnborough Town of the Conference had been drawn at home to Arsenal in the 4th round of the FA Cup but, in shades of the Rochdale tie in 1920, agreed to switch the game to Highbury to guarantee a much bigger pay day. To add to the extra gate receipts, Arsenal also gave Farnborough the profits from the sales of the matchday programme. Despite the game being played at Highbury, the records still show this as an away game for Arsenal. This was reflected in Arsenal playing in their away strip due to a clash of colours. With the North Bank in fine humour, singing “You’re supposed to be at home”, the game was effectively over within half an hour. Sol Campbell put Arsenal ahead after 19 minutes when he powered home a Giovanni van Bronckhorst corner. Four minutes later fox-in-the-box Francis Jeffers slotted home Kolo Toure’s cross from close range. Shortly after this, Jeffers was put through but was pulled back by Christian Lee just outside the penalty area. Referee Alan Wiley had no option but to show the Farnborough defender the red card, despite protests for leniency from the Arsenal players. Arsenal had plenty of chances to put the game to bed but it wasn’t until the 68th minute that Jeffers nodded in a van Bronckhorst cross to make it 3-0. Three minutes later Rocky Baptiste grabbed his own piece of personal glory, turning Pascal Cygan he sprinted into the Arsenal penalty and forced the ball into the goal at the second attempt after Stuart Taylor blocked his first shot. Substitute Dennis Begrkamp and Lauren finished the scoring. After this game, the Football Association changed the rules of the FA Cup which prevented venues being switched for financial purposes. For the third time in a row Arsenal went on to win the FA Cup, having played a non-league team. Already holders having beaten Chelsea in the 2002 final, the Gunners went on to retain the trophy thanks to a Robert Pires goal in the final at Cardiff. Until 1920, the Southern League wasn’t really “non-league”, it was actually a direct competitor to the Football League. To give an indication of this, when Tottenham won the FA Cup in 1901 they had four full internationals in their team. The FA renumbered the rounds in 1925. Prior to this, the 1st round was equivalent to the current 3rd round. The 12-0 win versus Ashford in 1893 remains Arsenal’s record score in a cup competition. If you enjoy looking through old programmes such as the one for the Bedford game, then visit our sister website – The Arsenal Collection – where we are in the process of making hundreds available, as well as other documents and memorabilia.